Time was shattered that day. My memory shot to pieces. An ordered life thrown into chaos, changed forever. and he came like a brother, but he ground my life to dust. Can I blame myself because I took safety for granted? with his invasion of my body, his murder of my soul. as if the way a woman looks can drive a man to violence? to tell but he took a knife to my tongue and left me speechless. a certain kind of listening that heals, even in a cavern of silence. Click to see photos of the live performance. 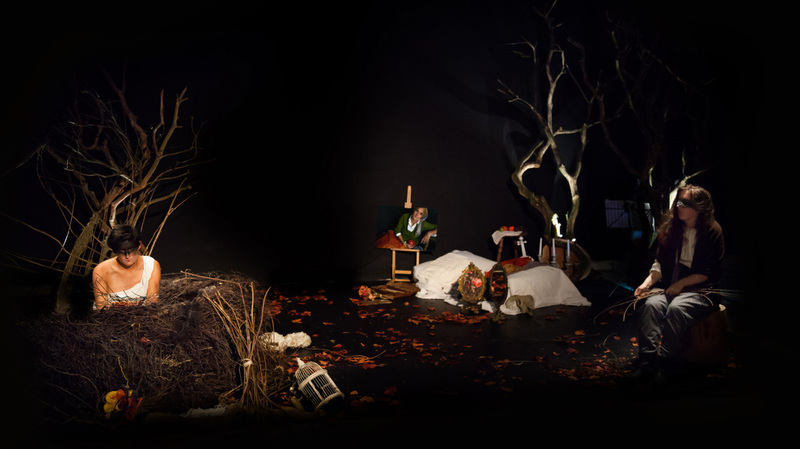 Lady of Situations is a collaboration with digital artist Shirley Harris, funded by the Arts Council, which took place over a period of eight months. It culminated in an exhibition and immersive performance which combined my poetry with theatre, digital art and music. Drawing on the classical stories of Philomela and Tiresias, the piece explored timeless themes of power, gender, exile, and survival. I began to write the poetic voices of Philomela and Tiresias after a series of collaborative photo-shoots from which the story had developed. West Yorkshire based Theatre Director, Amanda Huxtable, worked with us on preparing the script for a sixty minute live performance piece. 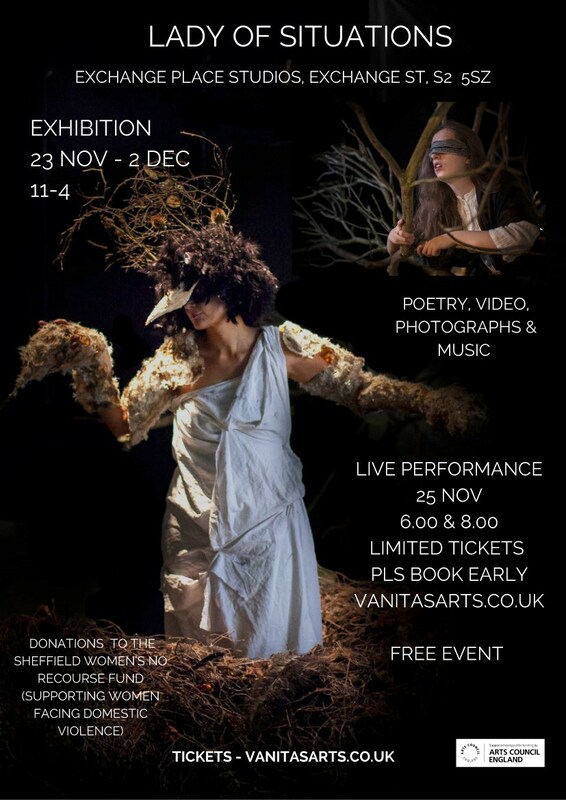 The production, which also featured commissioned artworks, was launched as part of Sheffield’s Off the Shelf Festival in October 2016. 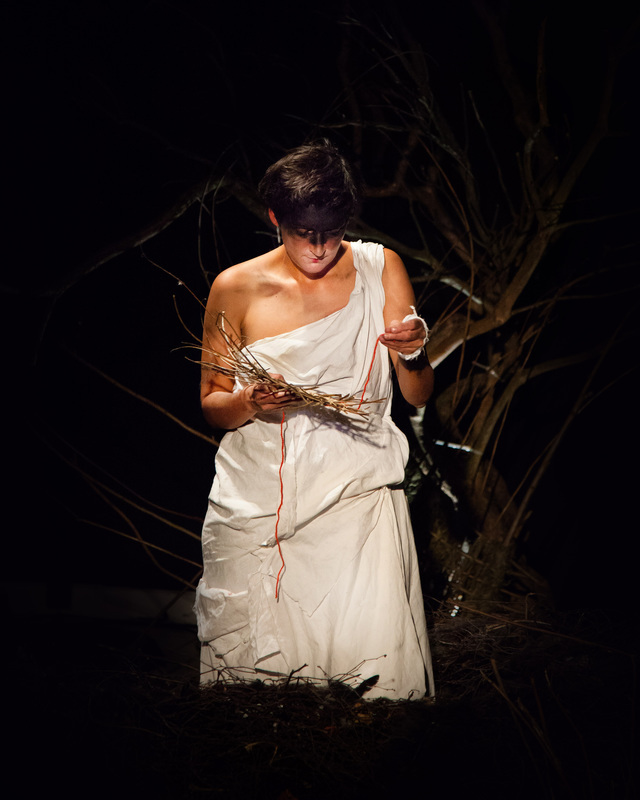 The performance begins with Philomela alone and exiled in a forest. Half-woman, half-bird, she is confined to a large nest on the forest floor trapped in the endless present of her recent trauma and unable to speak. Tiresias, the narrator, acts as witness to the impact of Philomela’s trauma and becomes an ally in her process of recovery and healing. 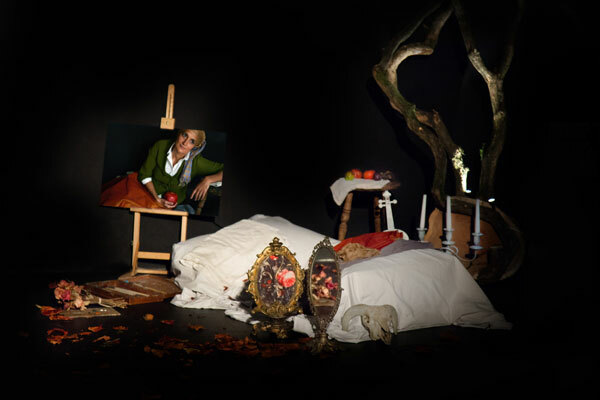 Images of Philomela’s previous life are presented to the audience, combined with a soundtrack that echoes her sadness and chimes with the playing of live cello. Philomela, though tongueless, finds ways to speak the unspeakable, including the creation of a tapestry in which she weaves her own story with others like hers. They say I’m a good listener. And these stone-blind eyes have blessed me with a second sight. Though some days it feels like more of a curse than a blessing – it’s hard to keep my balance on this tightrope above a faltering world. When you can read the sky’s omens and know how to follow the wisdom of birds, it makes for a precarious path between vision and madness. But I’m used to walking through fire and ruin and there’s more than two sides to any story. I should know, I’ve tasted both sides of a gendered life and didn’t rest easy in either place. There’s comfort in a certain kind of metamorphosis. This woman’s story is a hall of mirrors. There are many versions. Betrayal is at the heart of all of them. In this one you find her in a riven place where lichen clots the bark of trees. Black slate erupts like ancient standing stones. Old voices in the wind play tricks. And nature seems to be without mercy. It may look like a harsh place to enter but don’t be afraid. Come with me. I’ve been burned by my own monsters and survived to tell the truth of it. Listen to her strange cries, her distracted rage. Listen again for the whirr of her silenced words on a wingbeat. Listen. Not as bystanders but as witnesses. From her tongueless cavern, she will begin to throw shafts of light on unspeakable things. Be assured of this. Truth, like water, will out beyond silence. A trickle or a deluge, it matters not. blank canvas, before the naming of colours. burnt sienna, titanium, lamp black, lead white. for my attention, as I tracked the movement of light. an uncertain destination. That’s the beauty of it. so many calls on our time, people to attend to. in this compassionate capturing of transient beauty. Look in the mirror. Do you see yourself holding back like me in that place of uncertainty? You want to help but you don’t know when or how to step forward. In any case what’s true about a reflection? Mirrors often play tricks. One minute you exist. The next you’re gone. It’s easy enough to disappear like that from a life. One minute you’re living it, the next you’re forced to vanish. You run away, you’re chased away, you’re taken away from everything you took for granted. The remnants of an ordinary life disappear in the distance. You join a multitude of migrants, all carrying a story, looking for somewhere safe to set it down and build a life again. You walk a tightrope between hope and despair. You memorise the uses of forgiveness. Someone shows you your face in the mirror and you don’t recognize yourself. You are judged for your journey, suspected for your silence. in their comings and goings to a nest in the trees. the smallest things. How their weaving made circles. beginning to know the stillness of forest ways. was always running, always knew where it was going. of bark, tied each one piece by piece. It took patience. something to take hold of, another use for my knife. The Lady of the Forest begins to weave her own story with others like hers. When one woman speaks out a crack appears in the wall of silence. So many more stories are chipping away at the mortar. They begin to break through, like water through a crumbling dam, weakening the walls, bringing the possibility of its downfall closer. knows how to listen. I’ve no use for old comforts. begins, could the truth become a kind of vengeance? I brush my arms over the ferns. the forest is sighing with damp. It holds water like a sacrifice. I give it blood. It holds blood. The trees give me their silence. I walk in the forest until my lungs ache. your way. No hope of being found. done with. Nothing to be blamed for. how you look. You can get clean there. and make yourself clean. No-one sees. Muddy girl in the woods, painting it red. And leaves make good bandages. You fix them like a bracelet. Fix them. Fix everything. No-one ever needs to know. is full of Uncle Harry’s medals. of old books until it resembled parchment. but his bones are quieter than she needs. the butterflies and let them speak. is awake and my wings mean to fly.